I have never quite got the hang of decorating sugar cookies. I think that I am really just too impatient for the detail-oriented work and the amount of time it takes (including drying time!) to complete. 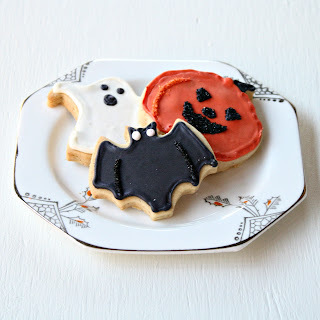 But, this Halloween I really wanted to make good use of my Halloween cookie cutters and give sugar cookies another try. I think they are a great way to celebrate holidays and they are also my guy's favorite cookie-so many reasons to try again! I decided to add pumpkin pie spice to my favorite sugar cookie recipe to make them even more Halloweeny. It was a perfect flavor and I think that the decorations even came out well. Now I can't wait until the next holiday themed sugar cookies!! In a large mixing bowl, cream together the butter and confectioners' sugar on medium-high speed until smooth, 1-2 minutes. Beat in the egg, vanilla extract, and the seeds scraped from the vanilla bean. Mix in the flour, spices, and salt on low speed until just incorporated. Form the dough into a ball and wrap with plastic wrap. Refrigerate until chilled and firm, at least 1-2 hours. Preheat the oven to 375˚ F and line baking sheets with parchment paper. Roll the dough out on a well floured surface to about ¼-inch thickness. 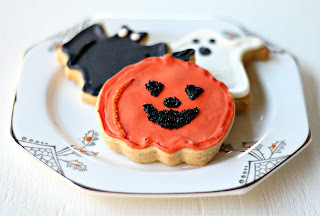 Cut with cookie cutters as desired and transfer to the prepared baking sheets. Bake 8-10 minutes, rotating the sheets halfway through baking, until fully cooked but not at all browned. Allow to cool on the baking sheet 5 minutes, then transfer to a wire rack to cool completely. To make the royal icing: Combine all icing ingredients in the bowl of a stand mixer fitted with the paddle attachment. Mix on a low speed until the sheen has disappeared and the icing has a matte appearance (about 7-10 minutes). Transfer the contents of the mixing bowl to an air-tight container. Add water a very small amount at a time and stir by hand until fully incorporated. Continue until the icing has reached a consistency appropriate for piping. Tint the icing with gel colors as desired. Using a pastry bag, pipe around the edges of each cookie. Let stand so the icing will set. Keep the leftover icing covered at all times when not in use so that it does not begin to harden. If you are keeping the icing overnight, cover it with plastic wrap and press this onto the surface of the icing to prevent the icing from hardening. Once all the cookies have been edged, transfer some of the remaining icing to a separate container. Thin out by incorporating a small amount of water at a time, until the icing drips off the spoon easily when lifted and then smooths in with that still in the bowl. Once the icing has reached the correct consistency, transfer it to a squeeze bottle (or a plastic bag with a hole in one corner), and flood the area surrounded by the piping on each cookie. If it does not completely spread to the edges, use a toothpick to spread it. Allow to set overnight. Be sure to leave the cookies uncovered overnight so that the icing sets properly. They will not go stale. When the icing has hardened, use the remaining icing to decorate the cookies with details as desired. Cookie recipe adapted from Annie's Eats. Icing recipe from Annie's Eats who has a wonderful royal icing tutorial. These are cute. I can't tell [on my iPad] but are those sprinkles on the eyes or black sanding sugar? The pumpkin pie spices in these sugar cookies sound perfect too. Yum. Thanks, Lisa! I used black sanding sugar on the details. I also used orange sanding sugar on the pumpkin's orange details. Always looking for the next recipe to bake or the next little thing to make.